I finally got around to fixing my Norge top case. Last year my Norge top case went flying from its mount after hitting some ruts on the side of the road doing 5 mph. First hit me in the back upon separating from the mount, then plopped onto the ground. Luckily the case wasn't that damaged, just a little bit of road-rash. I just had the case repainted by Maaco and they did a decent job for $175.00, certainly a better paint job than the factory paint job that Guzzi did when the case was first painted. 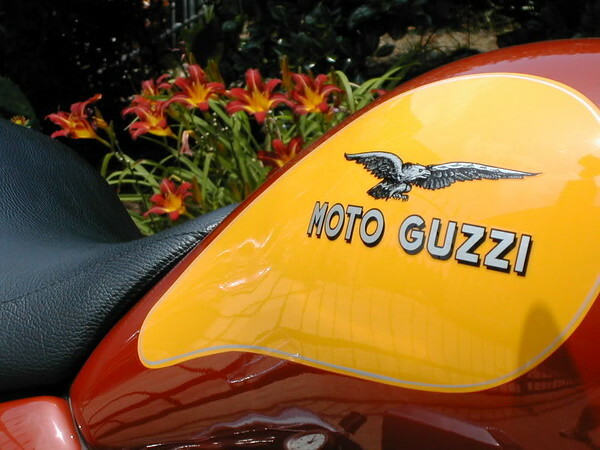 And just for info, Maaco used standard Dodge Viper Red color paint, which is a perfect match for Guzzi red. Now that I got the case repainted I wanted to make sure that it wouldn't go flying off again. So, my project today was to figure a way to bolt the top case directly to the mount. First thing I did was increase the size of the tang that slides into the aluminum lug on the mount. (see the first picture) This tang, which is about 1/8" stock from the factory, is all that is keeping the case from flying from the mount. This was simple fix to do with a file, and now the tang is closer to 1/4". Next I decided to weld a piece of 3/16" flat bar to the mount, (see picture 2) and then drilled a 10 mm hole through the top case and another through the 3/16" flat bar welded to the mount. Finally I took another piece of 3/16" flat bar and welded a 10mm bolt to it. Now when the case is on the mount I push the 10mm bolt welded to the flat bar through the hole in the case and then through the hole in the flat bar on the mount. Then after fitting a 10mm nut the case ain't going anywhere until I remove the nut. Re: I finally got around to fixing my Norge top case. Thanks for the report. I take it that this is the "original" mount??? 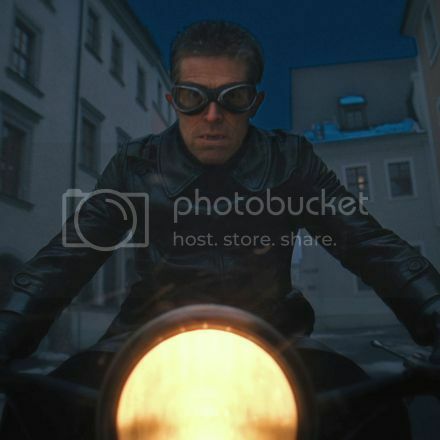 Or, is yours the modified replacement Guzzi sent out? Nice job there. You could also use a wing nut with a spring from the bottom to facilitate easy removal, yet keep it secure. If you're like me though, it wouldn't matter that much. Once I get something the way I want it, I don't take things on and off. Nice Job. I wound up drilling my hole through the horseshoe bracket itself and running a bolt and wing nut. 10 minutes out of my day to make the bodge. When mine flew off last year it was on there as solid as could be. I did 300 miles that day and hit all kinds of bumps in the road before I hit the ruts and off it came. Mine had the latest new mount when the case went flying and although it is stronger than the plastic lug model it replaces, it still is a crappy design. I'm sure many more top cases will fly from their mounts unless owners take steps to ensure they wont. Thank You for the heads up. Looks like cheap insurance. You did a nice job on that bracket. I got in to work today, seems like maybe Pikehk (Red Norge) was here and lost his top box on the way. Any Givi trunks done this? The pics have been uploaded again. Unknown why they disappeared. Here's my fix that I posted on GuzziTech last year. It's fast, cheap, easy, and has worked for at least 6,000 miles (with some real jolts along the way).